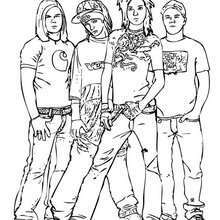 Welcome to Tokio Hotel coloring pages. Tokio Hotel, a German band was founded in Magdeburg, Germany in 2001 by guitarist Tom Kaulitz, singer Bill Kaulitz, drummer Gustav Schäfer, and bassist Georg Listing. 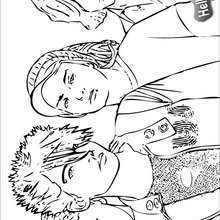 Print out Tokio Hotel coloring pages and enjoy coloring!